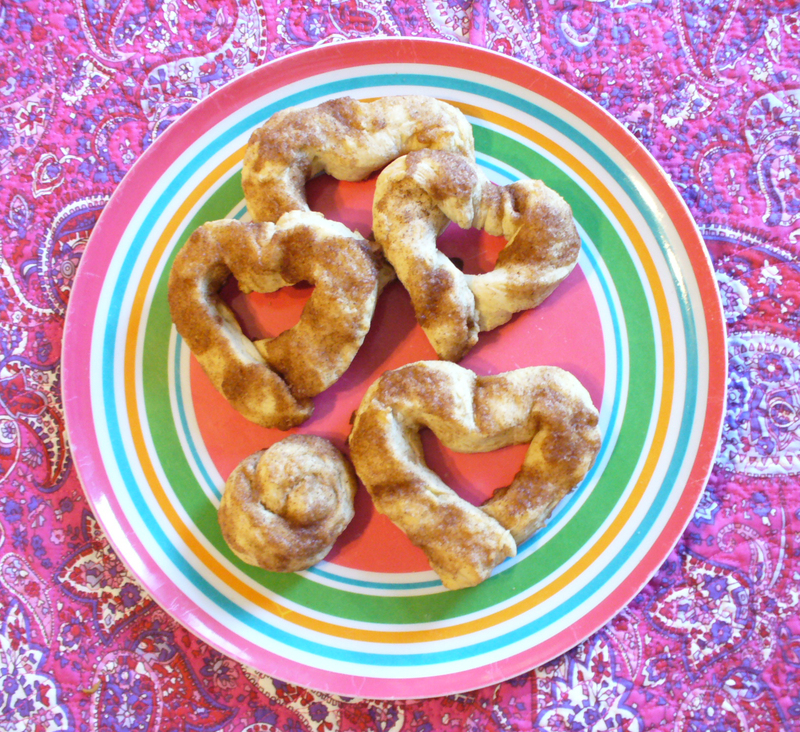 Looking for a perfect Valentine’s Day breakfast idea for your sweetie? Look no further! 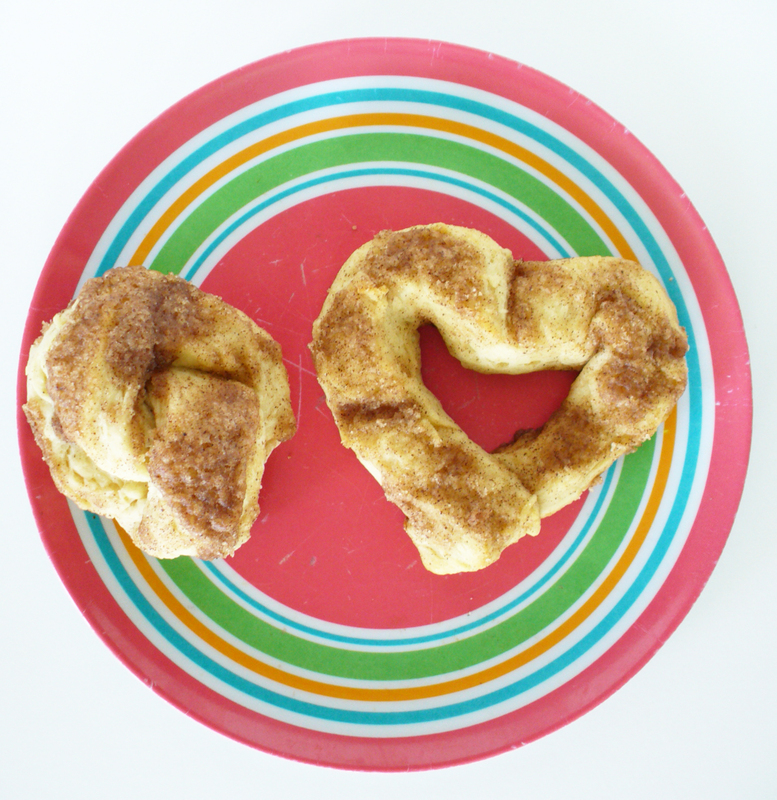 These cinnamon love knots (and hearts!) were absolutely delicious, and well worth the effort. Plus, you can customize them and make your own shapes! I chose to make hearts in honor of Valentine’s Day, but you could easily make letters, x’s and o’s, cupids arrow, whatever you can imagine! 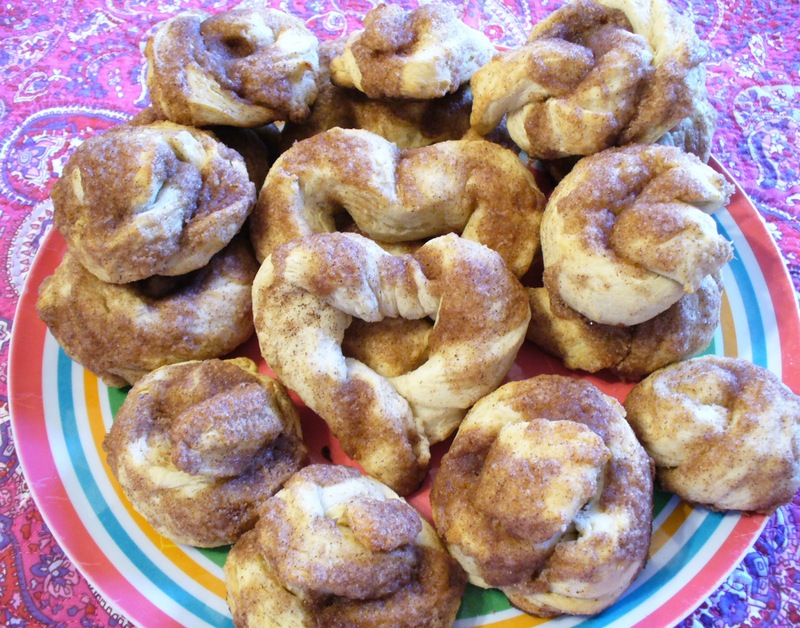 The recipe below was adapted from a lovely fellow blog; you may be familiar with, called One Perfect Bite. They have some truly awesome recipes and ideas over there! After reviewing the recipe, and doing a general Google search of how to actually tie the knots, I made some changes and revisions. That and I didn’t want to spend all of that time waiting, (there’s no way I could do that in the morning) and all that sugar! I encourage you to try both methods, they probably come out about the same, but I just love how my version came out! 1) In a large bowl, dissolve yeast in water. Let stand for 5 minutes. Add milk, butter, sugar, eggs and salt. Beat until smooth. Add a few small shakes of cinnamon and nutmeg, and one good shake of cloves. Stir in enough flour to form a soft dough. 2) If your bowl is large enough, knead until smooth and elastic, about 6-8 minutes. If not, use a flour dusted surface. Take dough out, use nonstick spray directly on bowl; place the down back in, spray a light coat over the dough. Cover and let rise in a warm place until doubled, about 1-1/2 hours. 4) When the dough has doubled/risen, punch dough down; divide into three portions. Cover two portions with plastic wrap or towel. Use a wide flat plate or non-porous surface to flatten out one section of dough into a circle. Using a pizza cutter, cut strands into about 1 inch wide strips, (see above video). 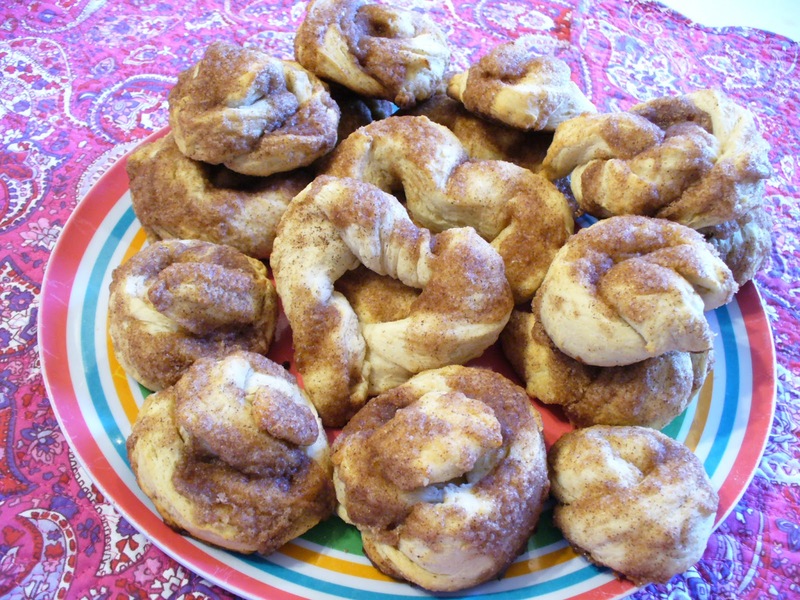 5) You may have to reheat your cinnamon sugar and your butter, as you want it warm and fluid if possible. 10-20 seconds in the microwave should do. 6) As you pick up each strand to dip in the melted butter, lightly stretch it out a little to give you more length. Holding each end, slide the strand through the butter on one side, then flip it and slide through the butter on its other side. Tie into a knot. Tuck and pinch ends under and place on parchment lined baking sheets. Repeat with remaining dough. 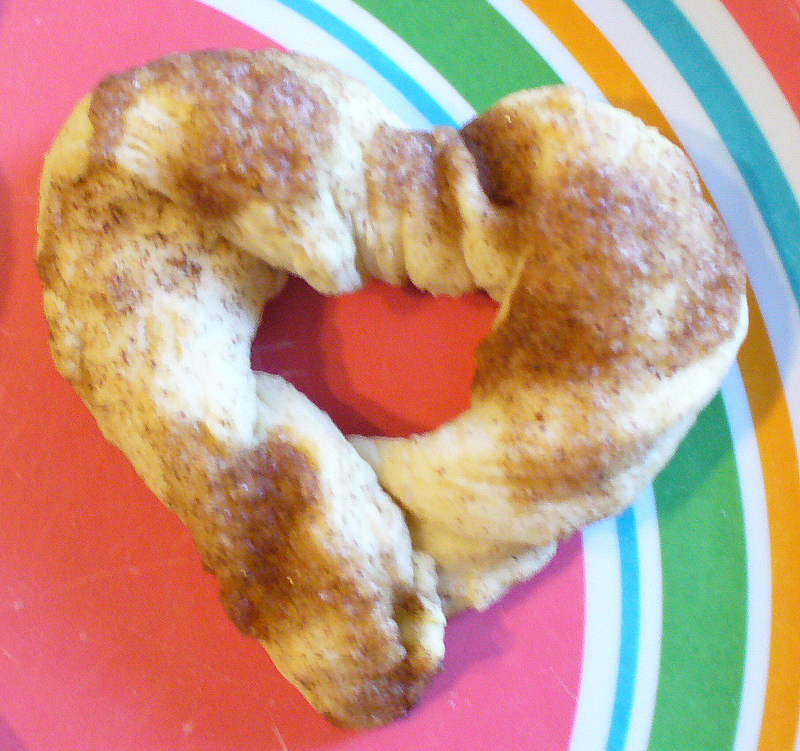 IF YOU ARE DOING HEARTS: I suggest twisting the dough after you dip it in butter, giving it a spiral twist look. The ends will connect best at the bottom of the heart, creating a point. 7) Using your fingers or a kitchen brush, scoop small spoonful’s of the sugar mixture onto the center of the dough, and work your way out spreading it in all of the crevices and edges. 8) Meanwhile preheat oven to 375 degrees F. When ready to proceed, for bake 10-12 minutes or until golden brown. Cool on wire rack. Hearts will take less time to cook. Additionally, you can easily reheat these in the microwave (if they even last that long!) I’ve had good luck heating one big knot for about 20 seconds.